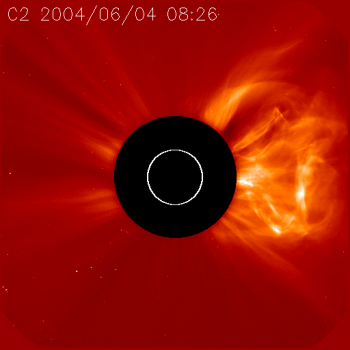 The goal of SEEDS is to automatically detect, characterize and classify transient/eruptive solar events, including CMEs, coronal dimmings, and flares, using state-of-the-art image processing, machine learning and data mining techniques. At the present stage of development, we have implemented two modules to automatically detect, track, and characterize CMEs based on SOHO LASCO C2 observations. Data usage: While the SEEDS CME catalog is timely and non-subjective, precaution must be taken when used for research. An automated catalog may be associated with certain computational biases. The LASCO detection rate is subjective to the image cadence. 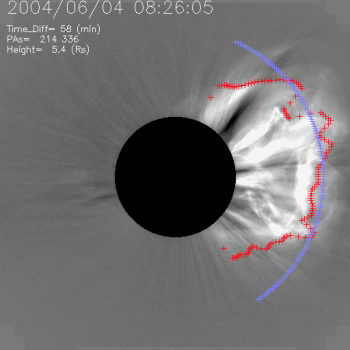 In 2010 when the EIT instrument on board SOHO was shut off, the C2 image cadence nearly doubled. This lead to a sharp increase in detections. The image rates are now provided in the catalog so that this effect can be normalized. The STEREO-B data has a number of systematic, erroneous detections that we believe to be a result of saturation at the occulter arm. In general, the SECCHI module has not been as rigorously tested as the LASCO module and all data should be treated much more carefully. For performing studies on the SECCHI data we reccommend restricting the data to events lasting longer than 2 frames to minimize these false detections. As of 2014 with the STEREO Spacecraft orbiting to the back side of the Sun, the SECCHI catalog will have intermittent data gaps when one or both satellites are not sending back COR2 data. Also, as the satellites move further away, the quality of the data may be lessened and lead to more errors in detection. This should be considered when examining the SECCHI catalog. Acknowledgment: This project has been supported by NASA Living With a Star Program and NASA Applied Information Systems Research Program. CACTUS - generated by the software package "Computer Aided CME Tracking" (Automated). CORIMP - generated by automatic detection of SOHO LASCO images (Automated). CDAW Catalog - generated by visual manual methods (Manual). NRL LASCO CME List - generated by operators (Manual).